their skills, are eligible for this course. Various styles of band literature and difficulty of music are used to develop individual and group performance skills. Emphasis is placed on proper breathing, tone quality, intonation, articulation, development of range, and music and reading skills. Wind Ensemble - 10th grade – 12th grade Students with Concert Band playing experience are eligible to audition for this course. A wide variety of styles of band literature and a high level of difficulty of music are used to develop individual and group performance skills. Chamber Orchestra - Chamber Orchestra is an auditioned string ensemble of student musicians, grades 9-12 who play violin, viola, cello,and and the double bass, and demonstrate a high level of performance practices. Advanced techniques, ear training skills, music theory, and appropriate rehearsal/performance disciplines will be taught and maintained within the group. Students participating must be available for public performances, solo and ensemble adjudicated events, and occasional after school rehearsals. Concert Orchestra -- open to all students in grades 9 – 12 who play violin, viola, cello, and the double bass. Proper technique, ear training skills, music theory, and appropriate rehearsal/performance disciplines will be taught and maintained within the group. Students participating must be available for public performances, solo and ensemble adjudicated events, and occasional after school rehearsals. Jazz Ensembles -- This group studies and performs a variety of literature, including swing, jazz, and rock. Each year, the group performs at concerts, adjudicated festivals, and various civic occasions. 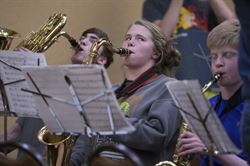 Special emphasis is placed on developing improvisation skills and ensemble playing. Membership requires a high degree of musical skill and personal discipline. Auditions will be held the week of September 5th-8th. Click here for detail and materials. Questions? Contact tim.martin@mpls.k12.mn.us | 612-668-3431. WHS DOWN THE FIELD -- Our great fight song. Course Description: 10th grade – 12th grade Students with Concert Band playing experience are eligible to audition for this course. A wide variety of styles of band literature and a high level of difficulty of music are used to develop individual and group performance skills. The fundamentals of basic musicianship will be emphasized. All band members are encouraged to be involved in some form of lesson experience to develop personal music understanding, appreciation, playing techniques, and musicianship. Emphasis is placed on a high level of proper breathing, tone quality, intonation, articulation, development of range, music reading skills, etc. Students participating must be available for public performances, solo and ensemble adjudicated events, and occasional after school rehearsals. Opportunities are available for solo and ensemble experiences through the year. The Wind Ensemble performs throughout the year for Concerts and Athletic events and has a local tour every year with an out of state performance tour every other year. A high level of instrumental technique will be taught through scales and exercises, and is used in selected literature appropriate for the group. Students will be assessed through daily performance, playing tests, and other coursework. Assessments include written and playing tests and concert participation. Students should have a high level of instrumental technique and knowledge of music. Students are expected to practice, and willing to practice on their own , demonstrating their ownership in their own success as well as the groups’. Students should be on time, be respectful, always strive for their best achievement, be prepared for rehearsals through practicing, and always be musical. Required Materials: Musical instrument either rented from school or student owned, notebook and pencils. Sheet music and folders will be provided by the school. Students will be responsible for those materials. 3.1 Sing, (in Band ?) you bet! 3.2 Perform on instruments, alone and with others, through a varied repertoire of music. 3.3 Improvise melodies, variations and accompaniments. 3.4 Compose and Arrange music, demonstrating creativity in using the elements of music for expressive effect. 3.5 Read and Notate music, specifically, whole, half, quarter, eighth, sixteenth and dotted notes, and rests in 2/4, 3/4, 4/4, 6/8, 3/8 and 2/2 meters. 3.6 Listen and Analyze music by demonstrating a growing knowledge of the technical and theoretical vocabularies of music, and analyze examples of a varied repertoire of music representing diverse genres, time periods and culture. 3.7 Evaluate music, by developing specific criteria for making informed evaluations of performances and compositions. 3.8 Relationships between music and the other Arts, and other content areas, by explaining how characteristic elements, artistic processes and principles are used in similar and distinct ways. 3.9 Through History and Culture, explain the uses of music. Students will review the foundations of performance practices. Formative- Daily and when needed. Students will maintain the foundations and performance practices of their instrument, and playing in an ensemble. Students will practice and prepare music for Concert Performance. Unit 4- January- End of Semester. Formative – Daily and when needed. Summative – District Wide Major/ Minor Scale Assessment. Unit 5- February- Jury- Solo and/or Small Ensemble music. Students will practice and prepare music for solo or small ensemble in class performances. Students will practice and prepare music for Concert and Contest Performances. Summative- Concert and Contest performances. Students will practice and prepare music for Concert and Graduation Performance. Student Assessments Formative- Daily and when needed. Summative- Concert and Graduation performance. 40% Daily Participation- has instrument, music, and positive performance practices. Grade Make-Up: Students who miss a performance for any reason must see the director and will be given an alternative assignment based on the music performed for the concert. Performance tests can be made up before school, lunchtime, or after school. Re-Learning and Retakes: There are no retakes for performances. Retakes for in class performance assessments are available up to 2 times within 2 weeks of the due date. Grading modifications may be made for students with IEP or 504 plans. Fight Song "Down the Field"
Cheer for the team at play. Click here for links to local and online music shops and resources . Woodwind and Brasswind - online full service music retailer for all your needs. Schmitt Music- Local store - String Shop, Sax Shop, Trumpet Shop, Trombone Shop, Flute Gallery etc. Groth Music - One of the Twin Cities oldest stores. Very close to Washburn and has a great selection for any musicians needs. Quinn Violins - A complete string shop.